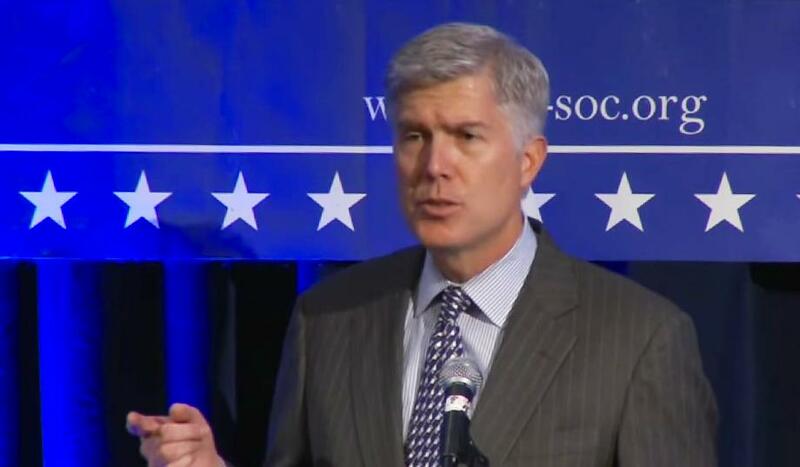 Neil Gorsuch at a Federalist Society event. Image via National Review. In recent days, President Donald Trump made good on one of his biggest campaign promises: to appoint a solid conservative justice to the Supreme Court to replace Antonin Scalia. Even former President Barack Obama’s Solicitor General supports Neil Gorsuch’s appointment to the Supreme Court. However, the fact remains that he is still awaiting confirmation. Despite what many activists who oppose his nomination firmly believe, Gorsuch’s confirmation is already almost guaranteed, and there are three distinct routes it could take to get him to the Supreme Court. In Federalists 76 and 77, Alexander Hamilton argued that having the president pick nominees and having the Senate advise and consent on them was the best system for American government. Part of the system included the likelihood that very few nominees would be rejected because the Senate would normally rather deal with what they know than whatever could be behind a proverbial curtain if a nomination were to be tanked. We don’t know who a backup for Gorsuch would be, but his confirmation is all but guaranteed for far more reasons than the one Hamilton laid out. Democrats are being pressured by their activists to oppose Gorsuch, but at a certain point they would have to concede that they want the Supreme Court to have only eight justices almost in perpetuity for that argument to hold any water. In this situation, at least 8 Democrats would join a unified Republican Senate in voting for Gorsuch. In this situation, Senate Democrats try and get the best of both worlds, appeasing their base by securing some nice sound bites but ultimately having at least 8 Democrats vote to confirm Gorsuch. It is incredibly unlikely that any Democrat looking at running for president in 2020 votes to confirm him (or indeed, any of Trump’s appointees). Senate Democrats have really regretted their decision to gut the filibuster on almost everything other than Supreme Court nominees. Back in 2013 they thought they would never lose another national election again, but that reality has been shattered and they are in dire straights across the country. In this situation, their base completes its takeover of the party and fewer than eight Democrats vote for Gorsuch, prompting Republicans to get rid of the 60 vote threshold they currently need to confirm Gorsuch. The first two scenarios require a combination of vulnerable Democrats and Senate institutionalists to come together vote for Gorsuch to avoid this scenario. This scenario would have been far likelier if Trump had chosen a problematic nominee, but Gorsuch has emerged entirely unscathed from the days since his announcement. If a coalition of at least 8 Democrats fails to materialize, Republicans are going to get Gorsuch anyway, and will have an easy time confirming any and all future Trump Supreme Court nominees. However, as Democrats have learned this time, that will inevitably come back to haunt Republicans later on. Anyway Senate Democrats look at this situation, Neil Gorsuch ends up on the Supreme Court. However, the path it takes to get him there will offer some serious insight as to whether Democrats have let their base completely take over their party or whether there are enough Democrats in the Senate who aren’t afraid of working with Trump. If Democrats have learned anything from the ease with which almost all of Trump’s nominees will go through, it is how important the filibuster can be at times.